Mardi Gras in Louisiana has a long, rich history. The first recorded celebration took place when a French nobleman and his crew celebrated Mardi Gras on a small island along the Mississippi River in 1699. The pre-Lenten parties found their way to French-ruled New Orleans in the early 1700’s. When New Orleans fell under Spanish rule in the late 1700’s, the parties were banned. After the United States acquired New Orleans as part of the 1803 Louisiana Purchase, a movement was started to reinstate the celebration. In 1823, the balls were reinstated and in 1827, masking in the streets of New Orleans became legal. The first recorded “parade” was in 1837 as revelers wore costumes and celebrated in the streets. In 1857, New Orleans’ first official “Krewe” was formed with the Mistick Krewe of Comus. They were the first organization to stage a themed parade with costumed riders. In the late 1800’s, the Krewe of Rex was formed and created the official colors of Mardi Gras: Purple (for justice), Green (for faith), and Gold (for power). Mardi Gras in New Orleans continued to grow, even through the Depression. However, the merriment was put on hold between 1942 and 1945 with America engaged in World War II. King Houmas I was John Foolkes and Queen Houmas I was Gloria Babin. 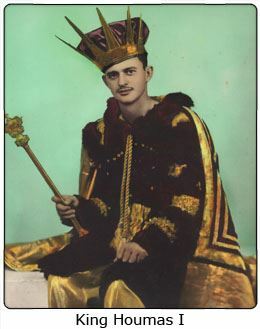 And unlike today’s Kings that are selected by the Krewe members, King Foolkes was elected from a ballot of candidates placed in the Houma Daily Courier! The first Royal Court did not have the service of any Dukes, only 20 maids. 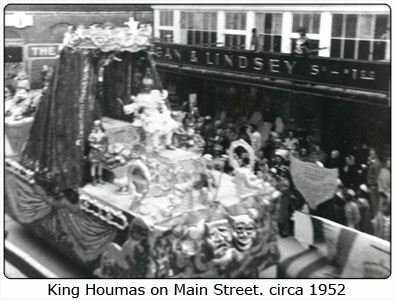 Even in the first year, Houmas paraded down the streets of Houma on Mardi Gras Day. For years, the Krewe rented floats (and even riding costumes) from clubs in New Orleans. To get to Houma, the floats were put on barges at sent down the Intracoastal Canal. In those days, the route started in East Houma and crossed into West Houma over the Intracoastal Waterway over the Main Street Bridge. Revelers could watch the parade on either side of town or take in a special view from their boats sitting in the Intracoastal. Eventually, the Krewe built their own floats and constructed a den on the Houma Airbase, near the beginning of the original parade route. With the completion of the new twin spans near the hospital, the parade route changed and Houmas changed along with it. The Krewe purchased land off of Hwy. 311 and built a new 35,000 SF facility to house its floats and a conference room. The building was designed to hold our current fleet and also give us room to expand. 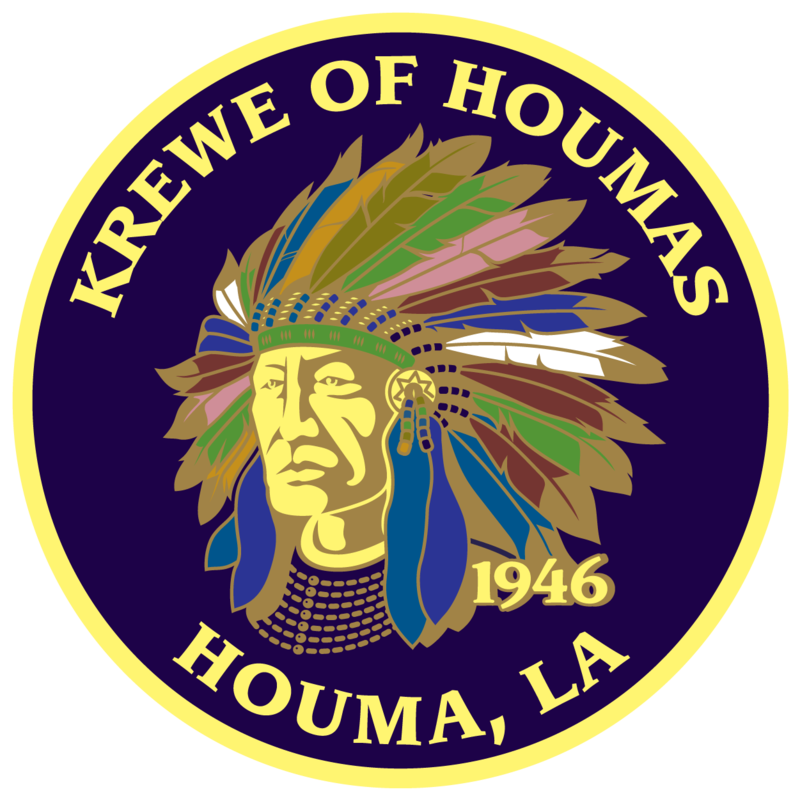 The Krewe of Houmas takes pride in being an organization that caters not only to its members, but also their families. Our Presentation Dance and Tableau prominently features the daughters of our Krewe Members. Our Annual Fishing Rodeo is enjoyed not only by our members, but also by our wives, sons, and daughters. The Annual Open House allows the families to come see the newly painted floats and experience fun for all. But the most important aspect of our family-rich history can be found on our floats every Fat Tuesday! Almost every float in our parade features either a father riding with his son or a pair of brothers riding next to one another. The Krewe of Houmas is proud of our tradition and history and we look forward to celebrating Mardi Gras Day each year with the special people of Terrebonne Parish!